This all started back on March 20, when in a fit of pique I posted on facebook: "Bay leaves are a lie. They do nothing." My friend Dan jumped in: "I cannot let pass this culinary heresy, Chris. Bay leaves, when fresh and used sparingly, impart a full-bodied, earthy undertone to a dish. Think of them as the Italian version of cumin(Mexican, Mediterranean) or tamarind(Indian). Overdo them and they'll render the dish inedible, which is why only one or two is advisable." I’m not sure what I was thinking, exactly, when I responded: "You are all sadly deceived. Agreed that cumin imparts the distinctive flavor of Mexican cooking. Tamarind does the same for Indian. Bay leaves add, at most, a bitter and inedible chunk of roughage in an otherwise pleasant dish." Dan: "You insult the bay leaf, Chris. This will not stand." Me: "Honor demands that we settle this like men: I hereby offer my kitchen and cooking services to prepare bay leaf enabled and bay leaf free versions of an identical recipe of your choice. I would ask you to provide the best bay leaves that you can find in the Boston area. I'll bring the beer." Dan: "Beer? Now I see the problem. I will accept this challenge. Prepare your kitchen dutifully, Chris. I will do as you ask and requisition the leaves. There can be no "beer", however. It must be a light red wine. Not a merlot or a malbec. Those are my terms. Me: "I would suggest Mark Stock as an educated and impartial expert. We can leverage his impressive knowledge of both wine and flavors. Let us ask him to select a suitable wine for the occasion. He will bring a wine bound to enhance what I assure you will be two indistinguishable dishes." Mark: "A Cote du Rhone will be acquired." Me: "I would propose an additional small term: a guest post on the loser's blog, to be authored by the winner, on the topic of the pointless leaf." Dan: "Mark, a Cote du Rhone is a wise choice. Chris, you propose a post of shame. A pillory to herbal ignorance. Grave terms. Let us discuss the punishment offline along with a date for this embarassment." Me: "I propose nothing more or less than honor demands. In the end the loser will eat the bitterest gall: his words." Dan: "If what you propose is a Facebook post of shame, then I accept. Long live the bay leaf." In the interest of space, I’ve omitted the hoots and catcalls of a quickly gathering crowd of friends and family, eager to see what all the fuss was about. On March 22, I posted a picture of myself chewing on a bay leaf in an honest effort to figure out what they taste like. So far as I can tell, they taste something like pine trees smell. On March 26, I posted a picture of my new stove. It really was totally unrelated. I was planning to buy a new stove anyway, but the timing was good. That same hooting crowd gathered … and a few more taunts were exchanged. Finally, on Saturday, six of us converged on my house to settle the matter. I prepared a tomato sauce in my usual style. I started with onions, caramelized them in olive oil, then added celery, pepper, garlic, and salt. I stirred in tomato paste and let it cook until it looked right. When the tomato paste looks “sweaty” that you’re good to go. Then I added chunked tomato (both preserved and fresh), minced oregano, and red wine. I split the sauce into three pans. To one, I added a couple of bay leaves. To another I added a double handful of bay. That was the “Over Bay,” or “OB” sample. The goal was to discern whether bay has a discernable taste. I covered the saucepans and let them simmer for about 10 minutes. Along the way, I made a salad and some green beans with sautéed garlic. A friend brought some bread that had risen at home and baked it in the oven. I cooked about a pound of whole wheat pasta. Somewhere along the way, we opened the wine and put out some cheese and olives. Once I declared the sauce ready, I dished the three samples into identical bowls, labelled on the bottom. I left the room and Dan marked on the sides of the bowls, “A”, “B”, and “OB”. We sat and ate. There were many rounds of toasts, with bold declamations on each side, sadly lost to history. Finally each person took notes. When we were done with dinner, we read the notes aloud. There was no need for math or analysis: Every single person correctly identified all three dishes. 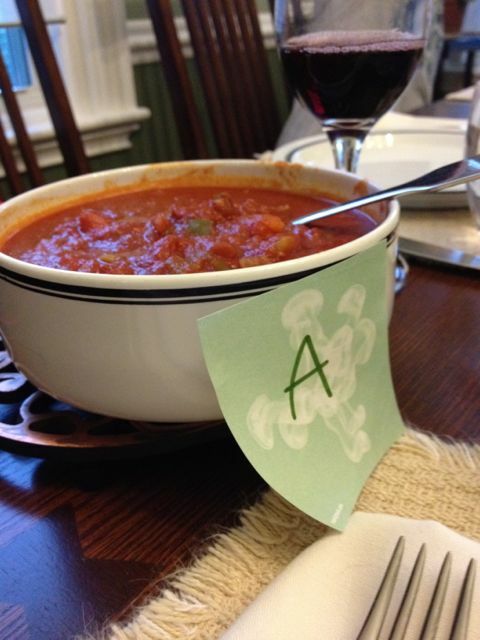 There was broad consensus that bay does indeed add a certain richness and depth of flavor to the sauce. 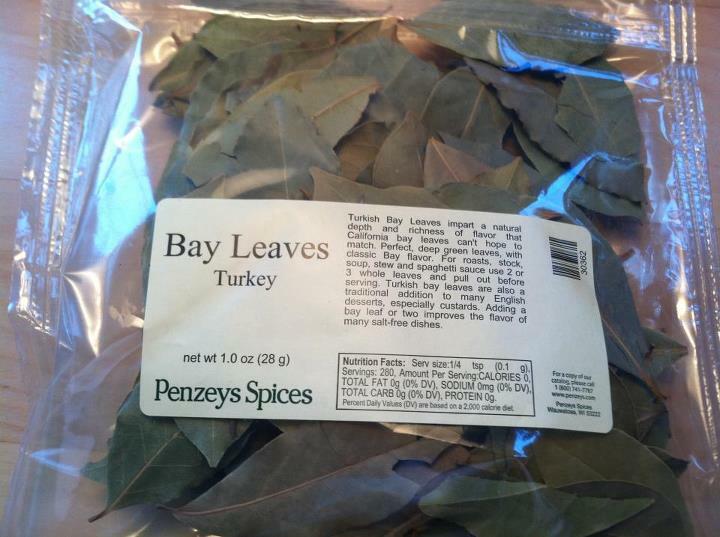 I admit that I was wrong, bay leaves do have a place in the kitchen.